The City of Winnipeg began to implement its Impact Fee in October 2016. Commonly referred to as an Urban Growth Boundary, this fee is placed on developments that happen outside of an area designated by the city. When Growth Boundaries (or Impact Fees) work well, they incentivize developers to focus housing efforts within the boundary, promoting density. Density is key to strong cities, as resources are focused into a smaller area, servicing a larger number of people. As with any progressive change, there has been backlash, primarily from developers who consider these fees an extra tax on their products. While those building car-oriented suburban developments will often argue home owners in these neighbourhoods pay higher taxes than those in established neighbourhoods, they neglect to factor in the cost of infrastructure maintenance and the added number of personal vehicles (because residents of these neighbourhoods have to drive to reach any destinations) the city now has to deal with, and the added congestion and greenhouses gases affecting all citizens. How to best alleviate the pressure on developers is to use the funds raised from developments outside of the boundary to incentivize developments within the boundary. A major flaw in Winnipeg’s Impact Fee plan is the intention to apply it “to industrial, commercial, institutional and office developments in 2018 and to residential infill developments in older and mature neighbourhoods, including downtown, in 2019.” (Winnipeg’s contentious growth fees kick in amid court challenge). Just like a carbon tax, any funds gathered from an action you want to discourage, should be put toward incentives for the actions you want to encourage, and we certainly do want to encourage infill development across all parts of our city within the growth boundary. Eric Vogan, the Vice President of Community Development at Qualico, spoke at the Liveable Cities Conference hosted by the Winnipeg Chamber of Commerce this fall. While most of his presentation tried to justify suburban sprawl and was quickly countered by fellow presenters, he did make an excellent point about how the City of Winnipeg works with developers on infill projects. He noted how the City will theoretically encourage density and multi-family housing in established neighbourhoods, but how developers then have to face intense scrutiny and Nimbyism from residents. Why would a developer want to spend the time and energy on developments within established nighbourhoods when they can have carte blanche to erect a new community from scratch on an open field? The Fort Rouge neighbourhood is built on a grid with shopping, restaurants, parks and schools integrated into the community within walkable distances. The City of Winnipeg must work with developers to clarify the requirements around infill development, so when a new housing proposal is approved by the City, the developer doesn’t have to face backlash from the neighbourhood. Using funds raised through the Impact Fee to reduce the costs for developers to build in established neighbourhoods, and to reduce the red-tape and Nimbyism from residents, is an excellent way to create clarity and make infill development appealing. 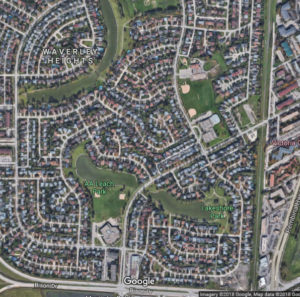 The City of Winnipeg, and really any city in North America, must do a better job at communicating the cost of suburban sprawl to citizens. As noted by Jack Diamond and David Thomson in the Globe & Mail “If we can reduce the cost of housing in established neighbourhoods with good transit and community facilities, and include the true costs of sprawl in the price of new housing, all Canadians will be better off.” (The True Cost of Suburban Sprawl). It’s important to consider the long-term maintenance and snowball infrastructure spending from adding more personal vehicles (often one passenger per vehicle) to the city’s roadways, as well as maintaining new schools, community centres and spreading resources for snow clearing, garbage pick-up etc. For example, in Winnipeg, a very short time after citizens began moving into Waverly West, it was determined that the added number of vehicles to Waverly Avenue necessitated the building of the Waverley underpass. This 155 million dollar project will be paid by taxpayers, not developers. If the Impact Fee had been in place before the building of this development, that tax burden could have been eased through the funds raised by the added fees paid by those who are adding the traffic to the roads. Or, better yet, the developer could have opted to focus housing in an area already serviced by transit and within a walkable and bikeable distance to grocery stores, schools, community centres and other conveniences. 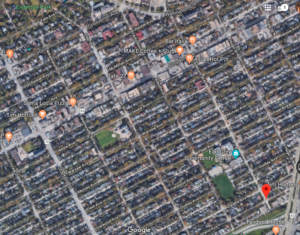 The Waverly Heights neighbourhood has a bigger footprint per house, but businesses are found off the map to the south, across a six lane road network. It would be difficult for a family in this neighbourhood to go for a walk for ice cream, or to walk kids to school. We also must consider what is lacking in established neighbourhoods to make them more appealing for home buyers who might consider a house in a car-oriented suburb. What has lacked in the planning of cities over decades in North America is the lack of quality public spaces. I know for my friends and family who live in the suburbs, they state over and over again the desire to have a big yard. Too often, dense neighbourhoods lack quality public space. “Where people go and where people meet are at the core of what makes a city work. So even more important than the buildings in a city are the public spaces in between them .. Lively, enjoyable public spaces are the key to planning a great city. They are what make it come alive” states Amanda Burden in her TedTalk, How Public Spaces Make Cities Work, about her experience designing public spaces in New York City, an environment where the fight for space is certainly a challenge! Ms. Burden was tasked with finding space for one million more people to live within city limits, with all developments having to be approved by neighbourhoods. I have a friend who lives not too far out of the urban core, towards Assiniboine Park. As her oldest son reached the age where she could take him to the park on her block, she was excited for him to meet other kids and make friends like she did growing up in the West End. She was perplexed to never run into other families in the local park, and that’s when she realized all of her neighbours had invested in swings, sandboxes and other park like equipment in their back yards. Their kids didn’t leave the yard, and their parents didn’t walk with them to play down the block. This is an interesting situation that many Winnipeggers can probably relate. It’s certainly handy to have a fenced in mini-park in the backyard, but what do we lose in terms of community connection? What is lost when kids don’t need to learn to walk to the park, first with their parents and later on with a group of neighourhood friends? What could we gain by having fantastic community spaces to gather with our neighbours? I spent some time this summer working in Berlin, Germany, a huge city with over three million people. Was it loud, congested, smoggy and lacking families? I was delighted to find it was a beautiful city with so many green spaces, with citizens out and about, enjoying parks, cafes, playgrounds and bookshops in their neighbourhoods. 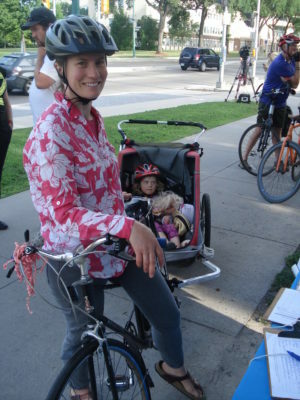 They may have had a smaller footprint than Winnipeg families in terms of their living space, but they and their kids had a whole city to enjoy, where they could easily get around on foot, by bike or on the fantastic public transportation network. I was truly shocked by how loud and hostile the traffic was in Winnipeg upon my return, it’s hard to believe our city of 750,000 people would be exponentially noisier than a city of over 3 million. We need to make a change. Neighbourhoods that invite families to walk, bike and take transit are key to healthy cities. People consider many factors when choosing where to live, which we examined in our blog, How Does Your Neighbourhood Score? It’s important to remember that individuals will always make the best choices for themselves and their families, but they are often making these decisions without full consideration of alternatives and without incurring the true cost. You will hear suburban dwellers declare their kids are “safer” in the suburbs, ignoring the fact that the leading cause of death for children is vehicle collisions and car-oriented suburbs mean more driving, for example. Aside from collisions, we can see the correlation between the reduction in the number of children walking and cycling to school with the increase in obesity, diabetes and anxiety. More details on the impact of travel behaviour on children’s health can be found in Making Children Count: A call to action to increase active school travel in Manitoba. we can see that suburban development imposes economic and environmental burdens – not just for the suburban dweller, but for all Canadians … Moving to the suburbs often means a need for a second car. Even economical cars cost about $10,000 a year to own. Other, less quantifiable costs include long commutes, increased emissions, higher risk of road accidents, fatigue and less home time. – Halifax Regional Municipality (HRM) found it would potentially save as much as $715 million over the next two decades by increasing the number of new dwellings sited in the urban core from 16% to 50% of new dwellings. – Calgary found that by adopting a denser growth pattern that used 25% less land, it could save $11 billion in capital costs alone. The City of Winnipeg’s Impact Fee is a neccessary tool to curb suburban sprawl in favour of density, as it will encourage better health outcomes. It’s important to note that the City of Winnipeg’s Impact Fee does not mitigate people who want to live in a car-oriented suburb from doing so. Too often criticisms claim the City is “forcing” people to live where they don’t want to. This is false, as Impact Fees simply ensure those who want to live beyond the boundary pay the true cost for their choice, as opposed to having the city subsidize this choice. Cities are slowly coming to terms with the high cost of free parking. Winnipeg is joining like-cities across Canada in recognizing the true cost of suburban sprawl, according to Dave Thomson who notes “Cities such as Edmonton are starting to do the math and collect the data that shows where they will potentially lose money on development. Historically, they have been afraid to turn down developers for fear that the property taxes they bring will go to another municipality. Now, they’re recognizing that turning down suburban development can actually save them generations of infrastructure costs” (Hidden costs of sprawl will cripple cities). It’s not surprising Winnipeg is in a similar situation to Edmonton, as we move from a time when Winnipeg failed to have policy in place to curb the development of car-oriented suburban sprawl, to this challenging – but ultimately fruitful – point where we move towards Winnipeg being a healthy, sustainable city for one million people. So what should urban planners be doing to protect health? Every effort should be made to create a built environment that facilitates the development of social life and community in a safe and hospitable public realm. Social interactions should be facilitated by wide sidewalks, traffic-free or traffic-tamed streets and public squares. The public realm should be enclosed by human-scale buildings providing eyes on the street, and ensuring sunlight at street level. Children and elders should live within eyesight and earshot of people on the street. Streets should be well-populated by local shoppers and pedestrians on their way to school or work. This requires a compact urban fabric for the city center and neighborhood that brings everything within a walking radius, and neighborhoods that are interconnected with public transit so that part of every trip is made on foot in the public realm. (Loneliness is Life Threatening: We Can Design Cities to Foster Community). Mel, thank you for another very well-researched and insightful posting. Good stuff Mel. You might want to consider transforming this into an Op. Ed or seeing if Peter D. would do with his op. ed column. Thanks Denis – will do! Very interesting and enjoyable read. Density and urban in-fill seem to make economic and environmental sense, not to mention betterment of quality of life. I recently had a conversation of this kind with a colleague in old St Boniface, near the hospital. He mentioned that he is leery every time a nearby house goes up for sale as he fears it will be converted into condos, which he feels would reduce his property’s value. This is a belief I have heard over and over again. I wonder if you know of any data that supports this or suggests otherwise (perhaps that it has no effect or improves property values)? Does a 3 story condo have less negative impact to a single family home value than an 8 story condo? 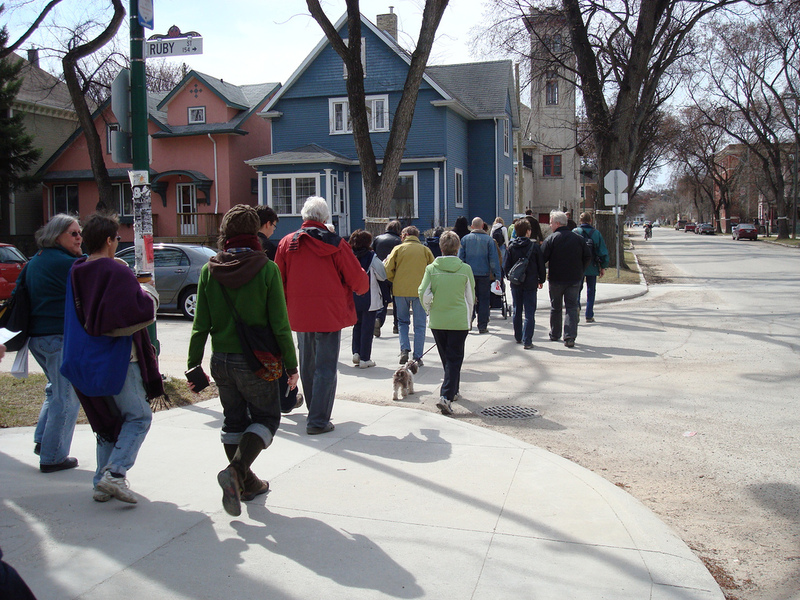 The reality is we have to density our neighbourhoods in Winnipeg, and more families mean schools are better supported, businesses can set-up and grow and people can now walk and bike to get the things they need, they don`t have to leave their neighbourhood to get grocery stables and the like. Change is always scary, but if your coworker knew there was a plan for his neighbourhood, and he was able to take part in discussions, he wouldn`t be fearful every time a property goes up for sale.